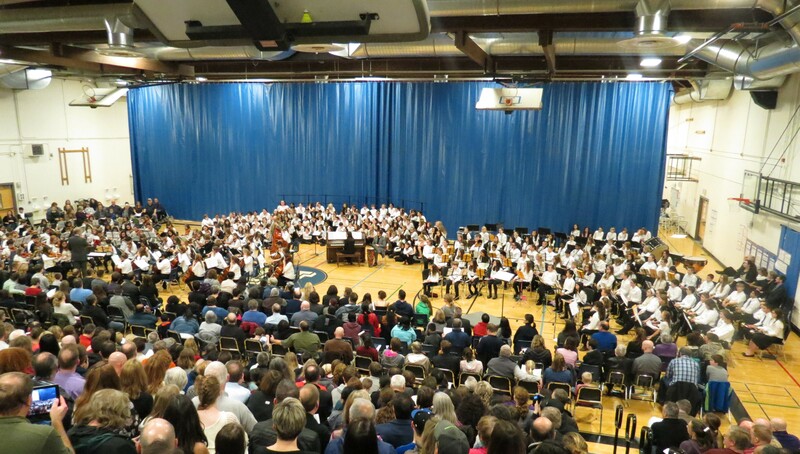 In a stellar performance, three honors groups—the best NSD musicians of 2015—entertained a packed house at Northshore Junior High School in Bothell on 10 February at the annual Northshore School District’s (NSD’s) Sixth Grade Honors Concert. First was the Honors Orchestra, conducted by Jim Rice of Inglemoor High School. Next was the Honors Choir, conducted by Kyra Renstorf of Woodinville High School and Leota Junior High School. Finally was the Honors Band, conducted by Janie McDavid of Shelton View Elementary and Kenmore Junior High School. [Incidentally, Mrs. McDavid’s husband is Dr. Brad McDavid, Director of Athletic Bands, University of Washington, who is featured in numerous posts in this blog.] Each group performed four pieces. The program was emceed by Ted Christensen of Inglemoor High School (IHS), who is Music Coordinator for the Northshore School District. This is his 32nd year at IHS. Below is a gallery of photos from the concert. As usual in this blog, I highlight trumpeters in the band, three of whom I teach at Skyview Jr. High School in Bothell. In all, Skyview contributed 12 musicians to the Honors Band. Please click on any photo to enlarge it. This entry was posted on May 2, 2015 at 9:22 am	and is filed under School Concerts. Tagged: band, choir, concert, Dr. Brad McDavid, honors, Janie McDavid, Jim Rice, Kyra Renstorf, Northshore School District, NSD, orchestra, Shawn McGinn, Ted Christensen, trumpeters. You can follow any responses to this entry through the RSS 2.0 feed. You can leave a response, or trackback from your own site.